Inky Fairy Designs: May Arts & Helmar Blog Hop! May Arts & Helmar Blog Hop! I am so excited about this hop. All of us at Helmar love playing with ribbon and May Arts always has gorgeous ribbon for us to play with. What is even more fun is that Helmar and May Arts are giving away TWO chances to win some great product on this TWO day Hop! Helmar will be offering two Arts & Crafts Starter packs! May Arts will be offering two prize packages of winner’s choice of 2 spools of ribbon! For my project, I took a simple plastic ornament and punched out a snowflake border with simple printer paper using a Martha Stewart punch. Then I laid it on top of the ornament like a mask, while it was own, I spread some Helmar Gemstone Glue over it with a paintbrush. While it was still wet, I poured some Art glitter in mystery over the top and removed the paper to leave the snowflake border showing through the glitter. I loved how it turned out. I add some red stickler to the center of each snowflake. Then, I topped the ornament with this luxurious Silky Crushed ribbon by May Arts. It really adds an elegant touch to ANY project!!! So, how do you enter to win a chance at one of these grand prizes? Hop through with us and visit each designer’s blog and leave a comment on their Helmar and May Arts Blog Hop post. The first winners will be chosen on the 21st and the second winners will be chosen after the Thanksgiving Holiday weekend! So let’s get started! This is a wonderful idea! It seems simple enough so maybe just maybe I can make one! I sure hope so because I really like it! Thank you! Very pretty ornament and love the glitters. So beautiful ornament! Perfect for my home! What a FUN project - thank you for sharing!!! That's so pretty! It almost looks ethereal. great project for the season at hand..
Love the idea. SO much better than glass ornaments that NEVER survive my grandkid's visit! 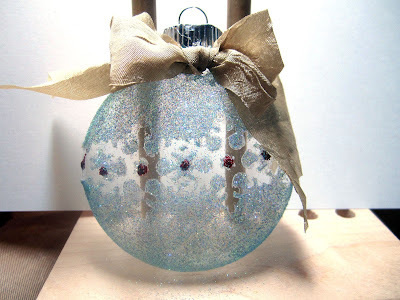 What a great way to decorate a plain ornament and turn it magical! Such a pretty glittery ornament. beautiful ornament! i love it. This turned out gorgeous! I love the colors you used and how you used both the ribbon and the Helmar adhesives! Thanks for sharing! very pretty--I like how you used a mask to create this ornament. A beautiful ornament and GORGEOUS ribbon! Oh so pretty! I love the blue and white colors! Love the look of your ornament - so very elegant. Thanks so much for sharing! Robin's Nest & Helmar Blog Hop!